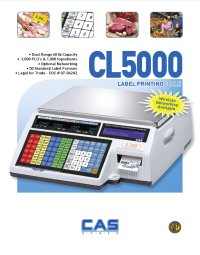 The CL5000 is a feature rich, easy-to-use label printing dual range scale available in 30 lb and 60 lb capacities. With its ability to use the most popular label formats and network multiple scales together on a wired or wireless network, the CL5000 is perfect for Deli's, Produce, Supermarkets, Bakeries, Convenience Stores, Health Food Stores, & Grocery Stores. Optional Fish Pan for the CAS model CL5000B and CL5000R Label Printing Scales.Dimensions 17" (W.. Optional Keyboard Protective Cover for the CAS model CL5000B Scale. *This will not fit the CAS model .. Optional Full Body Protective Cover for the CAS model CL5000B and CL5000R Label Printing Scales. &nb.. Optional Expanded Memory for the CAS CL5000 Label Printing Scales. Allows for 10,000 items.. Replacement Label Cartridge for the CAS CL5000 Label Printing Scale..
Label Size: 58 mm x 30 mm, 1,000 Labels per Roll, 12 Rolls per CaseCAS LP-1000NCAS LP-1000NPCAS CL50..
Label Size: 58 mm x 40 mm, 700 Labels per Roll, 12 Rolls per CaseCAS LP-1000NCAS LP-1000NPCAS CL5000..
Label Size: 58 mm x 60 mm, 500 Labels per Roll, 12 Rolls per CaseCAS LP-1000NCAS LP-1000NPCAS CL5000..
Label Size: 58 mm x 50 mm, 600 Labels per Roll, 12 Rolls per CaseCAS LP-1000NCAS LP-1000NPCAS CL5000..
Label Size: 58 mm, 1,200\\\\\\\\\\\\\\\" per Roll, 12 Rolls per CaseCAS CL5000BCAS CL5000RCAS CL5000..